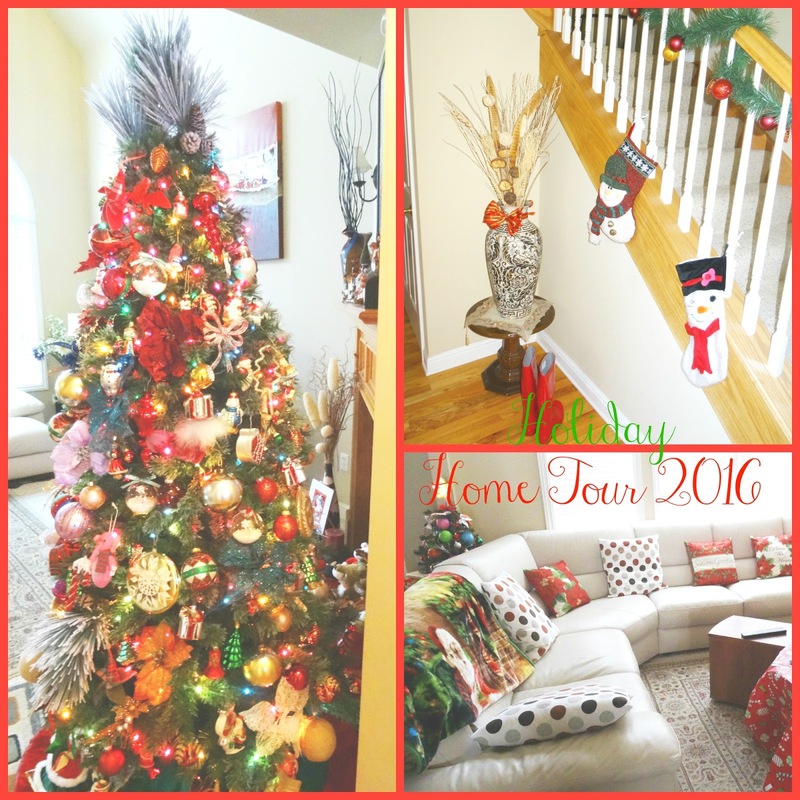 Winter Holidays Home Tour 2016. Plus Linkup. 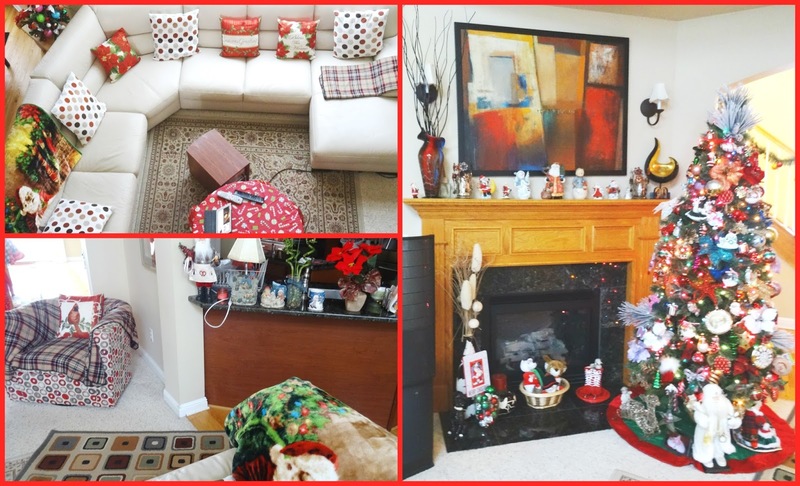 This Holiday/Christmas Home Tour is coming at you real late, since it is already a New Year and all and I am sure most of you have put away your Christmas decorations by now and I plan on doing the same, soon. For your information, I usually keep up my Christmas tree+decorations until January 6th. In the Christian religion, January 6th is considered the last or 40th day of Christmas, when the Christmas season ends and it is called the Epiphany day. I will probably take the decorations down on Saturday and Sunday this week. I took plenty of photos this year, like I did last year so there will be a part two of this tour and that will be on January 6th. Today I will be sharing how I decorated the Christmas Tree which is the princess or is it prince of the holiday season and I will show you how I decorated our living room where the Christmas tree is located by the mantle. I will mostly let the photos speak for themselves, but I will pop in with some comments here and there. Enjoy!! We bought a new tree this year, at Michael's (for 50% off). It is 7.5 feet tall, a Cashmere Fir type and it looks very real. It is in a dusty medium green color and the tips are a little white as if they are dusted by snow. I decided to go very colorful this year, as far as decorating it. The main colors I chose for the tree are red, gold, white and teal. As far as the ornaments there are different-colored and different-sized balls, poinsettias in white, gold, red, teal, orange and silver, a couple of Noel signs, a few hot pink cloth toys from Target (angels, dolls and elephants), some sentimental ornaments gathered through the years, a couple of Michigan balls, a couple of custom-made ornaments we did for this year, several red birds (some made of feathers and some of glass), candy cane ornaments, silver+red gift box ornaments, large gold plaque ornaments that read "Merry Christmas" or "Merry & Bright" and some of my large collection of glass Santas and glass snowmen. For the tree topper, I decided to add two big Christmas Tree branches that are in a heavy white coat (snow) which had some real pinecones in them (which I bought from Michael's, too). I chose the sparkly red+green velvet red skirt for the bottom of the tree. Around the skirt under the tree, was our Winter white+gold big Santa, the matching red Santa and Ms. Claus which sing and dance Christmas carols, a couple of faux gifts and the large gold wire reindeer. On the bottom of the fireplace, we have the two black+white porcelain vases we always keep there and the matching black+white porcelain dog. I added a festive red candle with a green leaves+cranberries wreath around it, to the circle short vase. 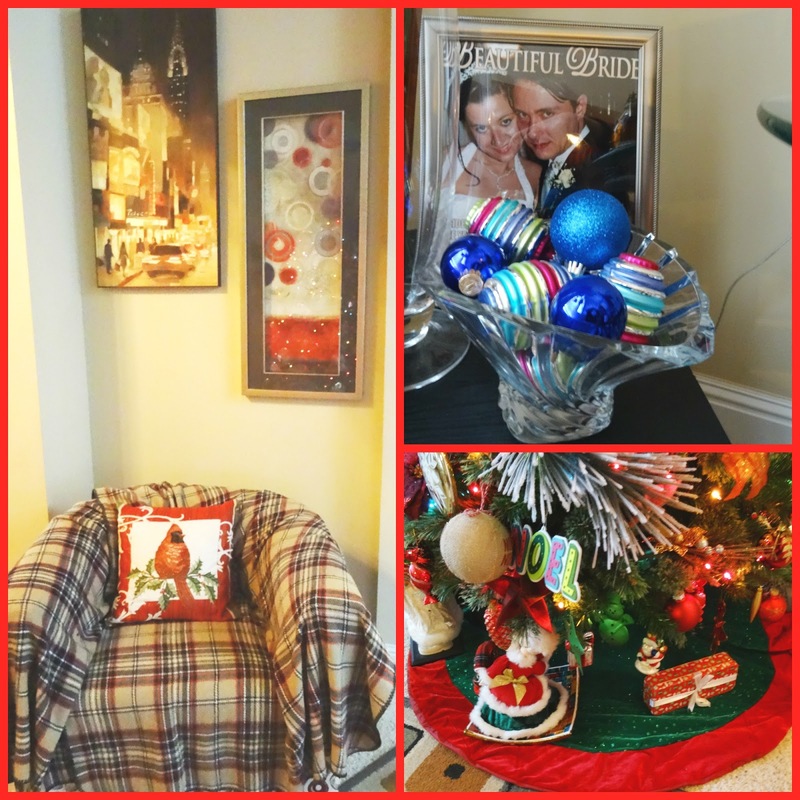 I hung a Christmas frame with this year's photo of Vivian and Santa on the tall vase, under the Wintery flowers, and in front of it there is a wide thick glass vase filled with silver, red and green glass ball ornaments. In the middle, there is a little wicker basket which contains some holiday stuffed animals: a reindeer, a snowman and a hippopotamus wearing a red Noel sweater and a green scarf. Last but not least, on top of the little red wicker basket we have our velvet red skates. They are one of my favorite Christmas decorations that I love to bring out each year. The bottom of the Christmas tree was filled with most of our presents on Christmas morning, only. The Mantle and the Fireplace. For the top of the fireplace I decided to go with a Snowmen and Santas theme this year since I have several. The biggest ones are in the middle surrounded by small Santas off the sides. The glass flower candle holders have green candles that smell like Winter with a colorful artistic vase with winter branches on one side and a large music decorative accessory on the other side. The side coffee table and the TV stand. I love putting ornaments in jars, glass bowls and crystal vases. This side coffee table besides the lamp has a few holiday photos, a circle music snow-globe and a Christmas-tree-shaped music snow-globe, two red+green present ornaments and in the middle the crystal bowl has oval ornaments in silver, fuchsia and turquoise stripes as well as some fuchsia, royal blue and turquoise ornaments. The back holds a large vase of flowers, a picture frame and another shorter vase filled with pink and blue ornaments. The TV stand got a few decorations too. I decided to put my collection of cloth Winter birds in there. I love how they are all geared up in scarves and hats. On the top shelf each of the festive glass painted platters has some Christmas decor on them. One has a Christmas-decked tree and the other has some candles surrounded by a few jar balls and off each side there is one small nutcracker. 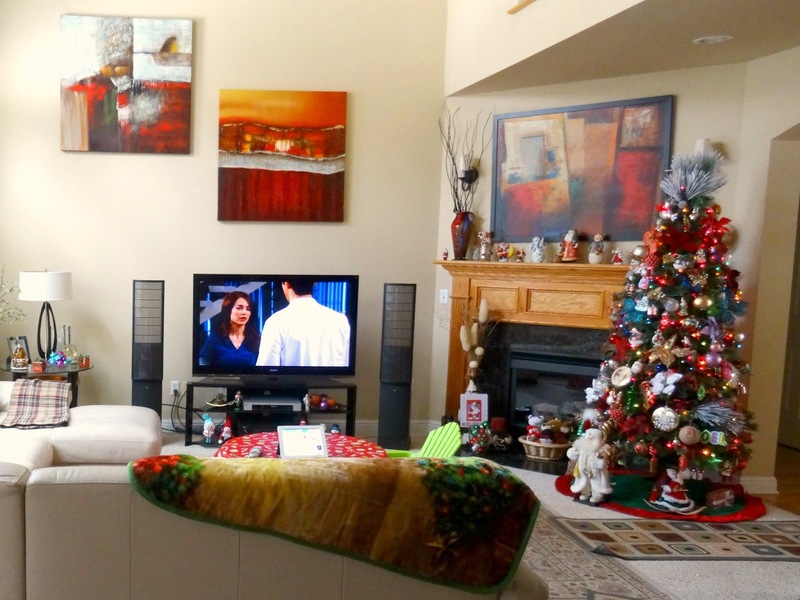 Between one of the large speakers and the TV stand there is a large stuffed dog wearing a candy-striped scarf. I shot the living room from different corners, even from up above (the second floor). Because Viv plays a lot on the coffee table and it is glass, I covered it with a festive candy cane+ornament patterned red vinyl table cloth. Usually, on the table we keep a red Winter candle and a tin of hot cocoa which serves both as a decoration and it smells great, plus it is quick access for when we want to drink some or pour over a dessert. All the four red pillows I purchased this year from Wal Mart for a steal. The one with the bird is my favorite. They are all cute, though. I alternated them with the Winter white velvet polka dot pillows. The plush throw with the gigantic Santa was also purchased this year from Wal Mart and it is super soft. I brought out the tan+red plaid throws. I threw one over the leather sofa for when we lay around watching TV and the other is dressing up the side armchair. 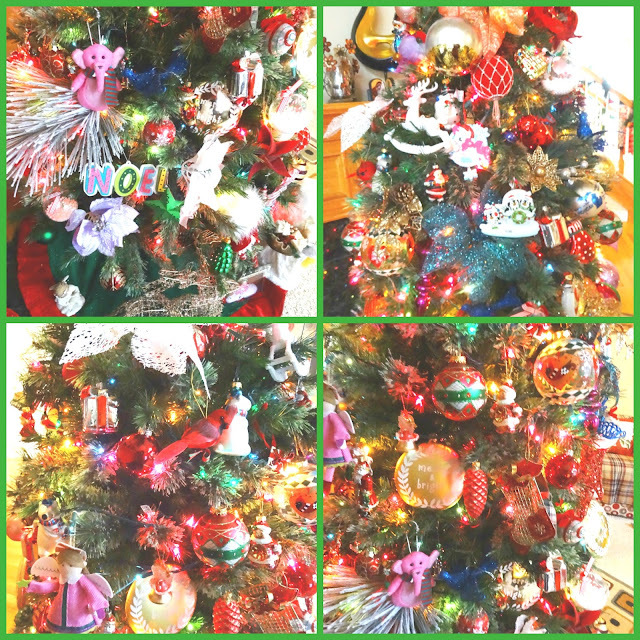 Right behind the the L-shaped sofa, there is another little side table and it holds a mini Christmas tree which I decorated with balloon-shaped ornaments in green, orange, hot pink and turquoise, some silver bows and a couple of other small glass ornaments. It has a colorful lit-up star on top. Here is one final look (for today) from up above the stairs. Doesn't it look gorgeous?! I hope you enjoyed my Holiday Home Tour today and stay tuned for part two on Friday January 6th. Have a great rest of the week and once again Happy New Year 2017! !